"Love to Allah (God) is the destination of success. Romance is the road of this righteous Path. The Captain of the ship is no other, but His Grace. Board in it and sail in the Ocean." Hazrat Amir Khusro was a great Sufi, a wealthy merchant who once exchanged all his wealth for a pair of His Holiness Sultan-ul-Mashaikh shoes, an intellectual gaint of many languages, an artist, a prolific author, a genius musician who invented the ‘sitar’, a versatile composer and a true devoted "mureed" of His Holiness. He was "All-in-One" type of highly amazing mixture of Divine gifts. 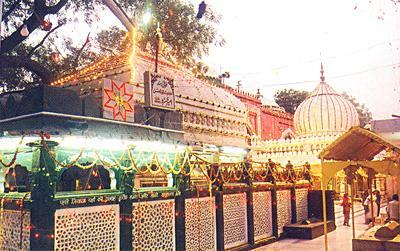 Hazrat Amir Khusro (R.A) was the son of Amir Alachin a Turk from Laccheen. His actual name was Saifuddin Mahmood Shamsi. At the invasion of Gengiz Khan he migrated from his native place Kesh near Samarkand to Balkh. Saifuddin was the chieftan of Hazara. Shamsuddin Iltamish the King of Delhi welcomed them to his capital. He provided shelter to the dislodged princes artisans, scholars and rich nobles. Saifuddin was among them. It was around 626/ 360 A.H/1226 A.D. In 1230 A.D he was granted afief in the district of Patiali (in Etah District-Uttar Pradesh). He married to BiBi Daulat Naz, who bore him three sons and one daughter. Yaminuddin (Khusro) was one among them born at Patiali, presently known as Hazrat Amir Khusro Nagar in District Etah (U.P.) in the year 652-653 A.H/1252-53 A.D. Yaminuddin’s (Khusro) father Saifuddin was mostly engaged in battles, and was killed in 660 A.H/1260 A.D. Yaminuddin or Khusro was an intelligent child. Poetry came to him at the early age of eight. "My father Saifuddin Mahmood Shamsi, the renowned breaker of enemies ranks, possessed might, enough to conquer the world with all the merits of his inner self, he never spoke about his inherent goodness and behaved like an Angel. He was a military commander and a saint. Although he was highly educated and cultured. He loved martyrdom from the beginning and he drank ultimately the Sharbate-Shahadat."